Where to Eat in Woking? | Curchod & Co.
Named Surrey’s best restaurant in the 2018 UK and Ireland Bookatable Diners Award, The Clock House in Ripley offers several seasonal menus to tempt your taste buds. Prices start from just £50 for two courses or £60 for three courses. They also offer a selection of vegetable tasting menus for dinner and lunch, which are available for £75pp. Known as the country pub on the River Wey, The Anchor can be found a short distance from West Byfleet, where a beautiful terrace runs along the riverside and roaring log fires can be enjoyed throughout those cold and dreary days. The location alone creates a glorious ambience that can be enjoyed throughout the year. Moreover, this dog-friendly pub means you can also pop in for a refreshing pint after a relaxing walk in the countryside. 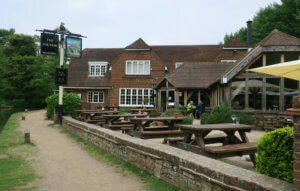 On the food and drink front, traditional pub fare such as prawn cocktail, steak and burgers are offered here, alongside a selection of dishes which cater for vegetarians, children and those who may have a smaller appétit. Of course, on Sundays The Anchor also provides a variety of different roast dinners for you to savour before hitting the ground running when Monday comes around. Located approximately 7.8 miles away by car, Bluebells Restaurant and Bar provides a relaxed ambience, making it the perfect place to entertain either for business or pleasure. Their two AA rosettes, along with the certificate of excellence in 2015 from Tripadvisor, would also suggest that they will deliver on their philosophy to serve exceptional food and drink, which was inspired by the local community. Whilst their menus change on a seasonal basis, their dishes are guaranteed to satisfy your taste buds with delicious desserts on the menu such as their Yorkshire rhubarb, mascarpone, meringue and honeycomb mess. This contemporary restaurant provides both an informal approach to dining, along with a wide selection of locally sourced dishes which include produce from the local garden and their pork which is reared on the estate. If you are seeking a flexible approach to eating out with freshly picked ingredients on the menu, then The Estate Grill is the perfect restaurant as their extensive kitchen has a variety of seasonal herbs, fresh fruit, vegetables and salad leaves which are hand-picked on a daily basis especially for you. If you are looking to impress a client over lunch, then their lunch menu also offers a set menu either for £21 for two courses or £25 for three courses. Based in the village of Ripley, Pinnocks Coffee House offers a variety of delicious cakes and coffee strengths to suit your taste. Alternatively, you may also wish to sample their homemade salads, sandwiches and wraps or perhaps a slice of cake if you’re after something sweet. Pinnocks attracts a wide array of people from across Surrey which also include families and well-behaved dogs alike. If you want to enjoy nature’s finest ingredients then make sure you head to Heather Farm where diners can experience a relaxing environment and children can play in the toys corner which is full of activities and books to help keep them entertained. This unique restaurant offers fresh organic food straight from the garden to your plate and focuses on creating an interactive experience for every individual. Prices start from just £8.50 for the Waters Edge all-day breakfast. Waters Edge is the perfect place to eat for those with special dietary requirements as they offer both vegetarian and gluten-free options. Looking for something more mainstream? Then why not try one of the many chain restaurants throughout Woking, which include some of the following, Côte Brasserie, Las Iguanas, Bill’s, Zizzi or Café Rouge to name just a few.